There are many battery operated devices such as cell phones, hand-held two-way radios, and portable GPS’s that have low voltage detection circuits. These circuits are designed to prevent the device from trying to operate at battery voltages that are below a safe value for reliable operation of the internal circuitry. Voltage supplied by a battery located very close to the circuitry drawing current from it remains fairly rigid even when the device draws pulses of current which is often the case. However, during testing of the device, a power supply is frequently used to power the device instead of the battery. Voltage supplied by a power supply, typically located quite a distance from the circuitry drawing current, will often momentarily droop each time a positive edge of current is drawn. This momentary voltage droop can cause an undesired trip of the low voltage detection circuit in the device interrupting the test. Here are some tips to reduce voltage droop caused by fast current changes on the output voltage of a power supply. Wires have resistance (R) and inductance (L), both of which develop voltage across them when a current pulse flows through the wire. Shortening the length of wire will reduce the voltage drop developed across the R and L, reducing the droop at the DUT. Never allow the power supply plus and minus output wires to become separated. This will substantially increase the inductance, increasing voltage drop with current, especially if the current changes quickly (V = L * dI/dt). Simply placing the wires next to each other is much better than letting them fall freely, but twisting them together is highly recommended over tightly coupling them without twisting. See example results shown below. As mentioned earlier, adding multiple wires in parallel reduces inductance. The best method to use here is to twist pairs of plus and minus wires together, and then run each twisted set separately to the DUT (bundling the twisted sets together is not as effective as keeping the sets separated). Some cables are designed specifically to have low inductance. Goertz wire is one example. Also, Temp-Flex makes low inductance cable. 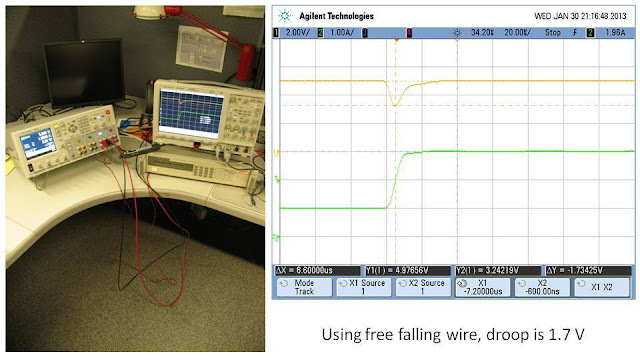 These types of wire can drastically lower the inductance in the path between your power supply and your DUT, greatly reducing voltage droop that occurs with current transients. However, these cables tend to be expensive. Remove as many connectors as possible between the power supply output and DUT. When current flows through a connector, voltage is dropped across the connection points. Some power supply vendors publish output impedance graphs. 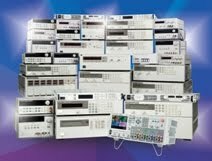 Try to use one with the lowest output impedance possible. Current pulses drawn from a power supply with lower output impedance will drop less voltage than a power supply with higher output impedance. You can reduce the effective output impedance of your power supply by adding a low ESR (equivalent series resistance) cap right at the output of your power supply. Many power supplies already have output caps and fairly low output impedance, so this will help only if the caps you choose actually help to lower the overall output impedance. When current is demanded by the DUT, having a local cap right at the DUT to provide the current will greatly reduce the voltage drop on the wire running to the DUT. This is because the required current comes from the cap and does not have to flow through the wire where it would drop voltage. It is important to choose caps with low ESR. Otherwise, when the current flows out of the cap, the voltage will again droop due to the current dropping voltage across the ESR. If you are having trouble with voltage droop due to fast current changes, each of the above tips will help to contribute to reducing the droop. If the droop is large, it is unlikely you will be able to use just one technique from above to fix it. Most likely, you will have to implement many if not all of the methods above to get the best performance possible from your test setup. 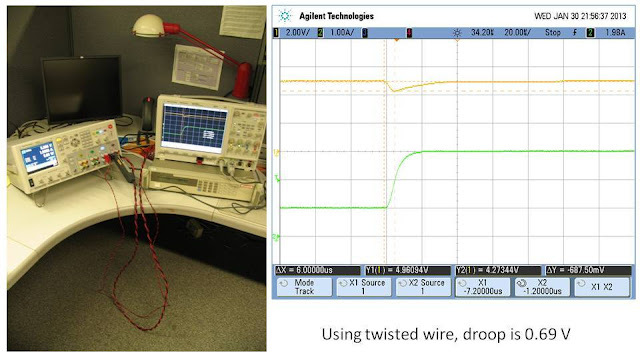 Below is a simple example showing measured droop differences when using three different wiring techniques: free falling wire, loosely coupled wire, and twisted wire. An Agilent N6751A power supply with 10 feet of 10AWG wire running between it and an Agilent 6063B electronic load was used. The N6751A was set for 5 V with a current limit of 5 A, and the load was set to switch between 1 A and 3 A with a rise time of about 10 us. Remote sense was used on the power supply, sensing at the load input. A current probe captured the current (lower waveforms) and the voltage droop was measured (upper waveforms) at the load input which was at the end of the 10 feet of wire. You can see the voltage droop was reduced as the wires became better coupled, lowering their inductance. The droop measured 1.7 V with the wires free falling. This droop was reduced significantly to 0.84 V with loosely coupled wire. Further reduction in droop was observed when the wires were twisted: the droop measured 0.69 V.